Tetsuo Yukioka, managing director of Tokyo Medical University, speaks during a press conference Tuesday, Aug. 7 in Tokyo. The school confirmed that it systematically altered entrance exam scores for years to keep out female applicants and ensure more men became doctors. Five days after multiple news outlets reported that Tokyo Medical University officials systematically cheated women out of rightfully earned spots at the prestigious college by lowering their admission-test scores, officials have confirmed the practice and apologized for the discrimination. The conclusions of an internal investigation report released on Tuesday, according to The Associated Press, revealed that admissions programs were altered to automatically deduct points from the test results of all applicants on the first round, then add up to 20 points for male hopefuls. The aim was to artificially reduce women's enrollment numbers from a high of nearly 40 percent in 2010 to approximately 30 percent now. 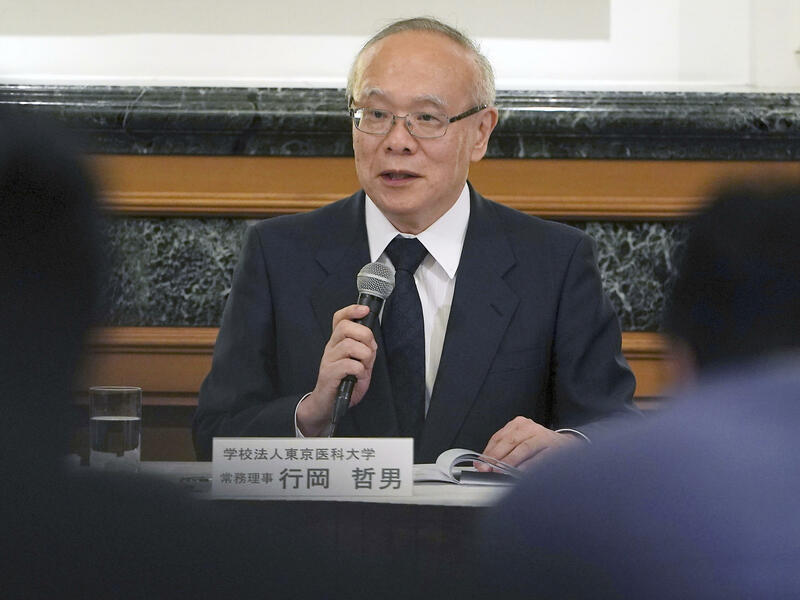 Tetsuo Yukioka, the university's managing director, and Keisuke Miyazawa, vice president of the university, bowed deeply in apology at a press conference Tuesday. "We betrayed the public trust. We want to sincerely apologize for this," Yukioka said, as quoted by Agence France-Presse. "This absolutely should not have happened," Yukioka added, according to the Wall Street Journal. Bloomberg reporter Kurumi Mori translated Miyazawa as saying, "When I think about the female applicants who could have been admitted but were denied, my heart aches for them." Officials said the school would consider retroactively admitting students who were rejected as result of test altering, but they failed to provide to details on how it would do that, USA Today reported. As NPR's Merrit Kennedy reported, the investigation was triggered by a bribing scandal involving Futoshi Sano, a high ranking official within the education ministry whose son had poor entrance exam scores, and Masahiko Usui, the university's former chairman of the Board of Regents, and Mamoru Suzuki, the former university president. Sano secured about 35 million yen in government subsidies for the school in exchange for a spot for his son at the university. Usui and Suzuki were indicted in July. The discovery revealed Sano's was not an isolated case and a broader admissions probe was launched. Investigators subsequently found a list of "priority" male students who also benefited from falsely boosted test scores after their parents made substantial donations, The Telegraph reported. Previous reports, including NPR's, indicated the test score scandal had started in 2011 but the AP reported on Tuesday that it began in 2006 "or even earlier." "By deceptive recruitment procedures, they sought to delude the people taking the tests, their families, school officials and society as a whole," Kenji Nakai, a lawyer who took part in the investigation, told The Telegraph. "There were also factors suggesting very serious discrimination against women," he added. Nakai noted that it is unclear how many women were rejected from the medical school as a result of the score tampering. Lawyers investigating the medical school's policies said the favoritism shown toward male students stemmed from the belief that women are more likely to leave the medical profession when they marry and have children. "Japan lags behind other industrialized nations in its ratio of female to male doctors. As of 2015, just 20.3 percent of its doctors were female, according to data from the Organisation for Economic Co-operation and Development. That's the lowest of the countries surveyed. The average of the 34 countries was 46.1 percent female. The U.S. has 34.1 percent female doctors, and Latvia was the highest, with 74.3." The story has caused outrage in Japan. In the days following the initial reports of the test score manipulations, women stormed the university in protest, the AP said. Some carried signs reading: ""Protest against sexist entrance exams!" and "You trampled on the efforts and lives of women who trusted and chose you."